On Monday, the S&P 500 Index came about as close as possible to the technical definition of a bear market without officially registering one (defined as a 20% or larger decline based on closing prices). Enduring these sharp declines can be unnerving for any investor, making it difficult to avoid the urge to react and sell at market lows. 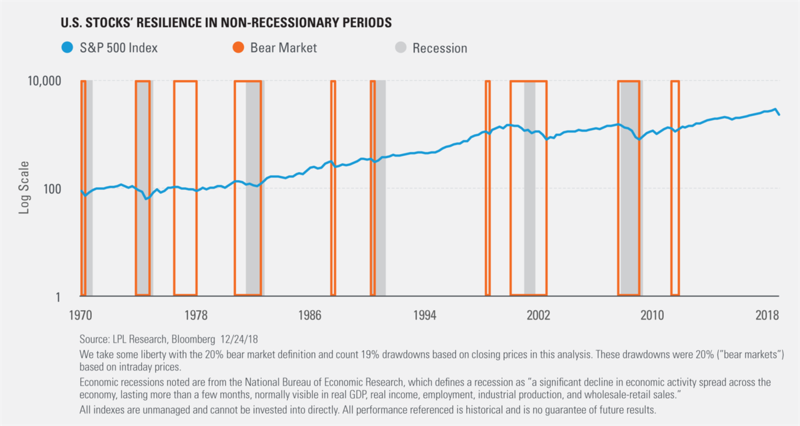 To hopefully provide some reassurance and perspective, we offer some historical context about this recent volatility and the relationship between bear markets and recessions. Going back to World War II, there have been 14 bear markets, with 7 of them accompanied by a U.S. economic recession and 7 during economic expansions. The recessionary bear markets were quite painful for stock investors, with an average S&P 500 decline of 37%. A look at the non-recessionary bears is a bit more comforting. Three of the past four non-recessionary bears ended at 19% corrections. The fourth, a 34% decline in 1987, occurred under very different conditions. The S&P 500 was up more than 40% year to date in August 1987, compared with gains just below 10% through the September 20 high this year, while long-term interest rates shot up from 6% to 9% in 1987. Including 1987 and the four other non-recessionary bears before then (1947, 1962, 1966, and 1978), the average non-recessionary bear market drop is 24%. Bottom line: U.S. stocks have endured swifter, shallower bear markets when the economy isn’t in a recession. When the U.S. economy is growing as it is now, and as we expect it in 2019*, those declines have tended to stop at around 20%. What Does That Mean for Today? We understand that in this volatile market environment, it can be difficult to stick to your long-term investment plan. We hope this historical perspective helps in that regard. Over the long term, stocks have proven to be quite resilient as the economy expands and companies adapt, innovate, and drive profit growth over time. We encourage investors to remain focused on the many fundamentals supporting growth in the economy and corporate profits, and stick with your investing strategy. * Please see the Outlook 2019: FUNDAMENTAL: How to Focus on What Really Matters in the Markets for additional description and disclosure.